Lightning Motorcycles has signed two-time Isle of Man TT Winner Cameron Donald to race for the team in the TT Zero and European electric motorcycle racing. The Australian won both the Superbike and Superstock classes during the 2008 TT Week. He joins Michael Barnes and Miguel Duhamel on the Lightning Motorcycles racing team. In the 2013 season, the team intends to race in both North American and European electric motorcycle racing, as well as a return to Bonneville and El Mirage for land speed racing. Their exact schedule will depend on funding as well as rider availability. Neither the FIM e-Power nor TTXGP series' have announced the 2013 electric motorcycle racing schedule as yet, however we have heard this announcement is imminent. Lightning expects to have Cameron Donald ride in European events including the TT ZERO, while Barnes and Duhamel will cover the North American events. Michael Barnes has ridden for Lightning in TTXGP races since 2010. Miguel Duhamel rode for Lightning at the FIM e-Power race during the 2012 24 Hours of Le Mans. For Lightning's land speed runs they've had Paul Thede in the saddle. This makes another top motorcycle racer signing up to race on an electric motorcycle. Earlier examples include not just Barnes and Duhamel, but Eric Bostrom who joined the Brammo team in 2012, and Steve Rapp who rode for MotoCzysz in 2011. As the electric motorcycle field starts to move beyond early adopters it will help to draw fans if big name racers are in the saddle. Nissan says they will return to the 24 Hours of Le Mans in 2014, with an electric race car. Maybe. The press release isn't precise enough to be certain, but it did promise an "all-new race car incorporating electric technology." That's enough to make our minds to "whuuuh??" Let's first start with carefully describing Nissan's announcement before pondering what this means. Nissan President and Chief Executive Officer Carlos Ghosn made the pledge to return to Le Mans during a special event today in Yokohama, Japan to open a new headquarters for NISMO, Nissan's global performance and motorsports brand. He talked about "a new approach to innovation and excitement [that] will be at the project's core" and confirmed that Nissan's 2014 Le Mans entry will be the "Garage 56" entry for innovative concepts with an all-new race car incorporating electric technology. 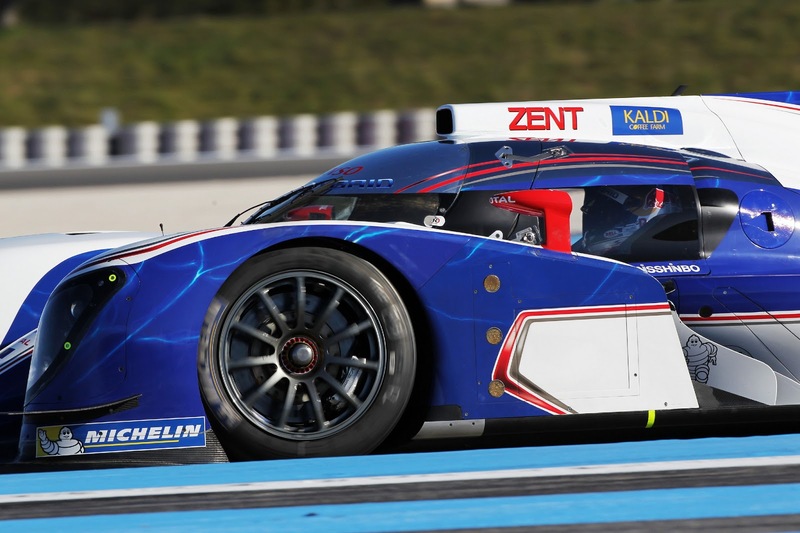 I don't know Le Mans, but from reading other reports on this Garage 56 is reserved for experimental vehicles, in 2012 it was occupied by the Nissan Delta Wing, and in 2013 it will be occupied by a hydrogen fuel cell race car dubbed the GreenGT. "We will return to Le Mans with a vehicle that will act as a high-speed test bed in the harshest of environments for both our road car and race car electric vehicle technology," said Mr. Ghosn. That's about it other than a promise to release more details soonish. Now we get to ponder about how Nissan could plausibly run an endurance race with an electric race car. Electric cars in general have lower energy density than petrol cars, which is the key to their limited driving range. The petrol race cars do make pit stops to refuel, but those stops are typically a minute or whatever minimal length of time to put the least impact on race results. Electric cars however require a long recharge time, relatively speaking. First - is this going to be an all electric car? The press release does not use phrases like "zero emissions" or "all electric." It instead says "race car electric vehicle technology" which I find to be imprecise enough that I'm not convinced this will be an all electric car. However, if it were to be a hybrid race car they would have said so, right? Maybe it is an all electric car? Second - if it is an all electric car, how can they hope to make more than a couple laps with it? That is, the Drayson electric race car lasts for 15 minutes or so of racing time. The Formula E electric race cars will have a similar racing time, and in that series they'll be using four cars per team for a continuous race. There are two ways to go about a longer race format like a 24 hours endurance race in an electric car. I've seen a 24 hour endurance race run with electric vehicles - the 24 Hours of Electricross staged by Zero Motorcycles in 2009. In that case each team had 3 battery packs, one on the bike, and the other two in the pit charging. The Zero bikes used in that event have fast swap battery packs that can be exchanged within a minute or so, which let the rider exit the race, swap the packs, and a fresh rider get on the track, all in a jiffy. It's plausible then that a fast swap battery pack could enable an electric race car to run for 24 hours. I can hear the question: Isn't that cheating, compared to petrol race cars? No, it isn't. It's the equivalent of the petrol driven race cars refilling the fuel tank. 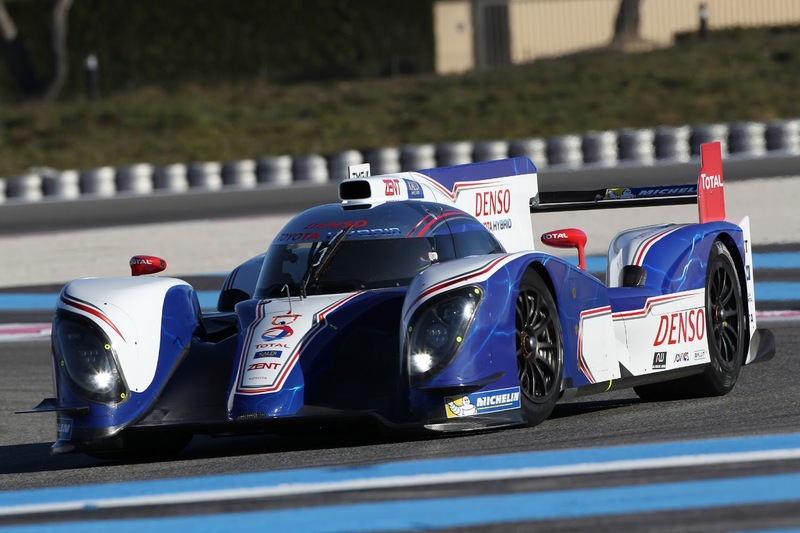 Toyota Racing up's its hybrid race car game with a revised TS030 Hybrid car. Okay, it's got a gasoline engine in it so why are we covering this on ElectricRaceNews? It's because of the hybrid half of the machine, with Supercapacitors boosting its performance and enabling the TS030 to perform so well against Audi hybrid race cars during the 2012 World Endurance Championship season. Both these cars use electrification to boost performance enough to convincingly win races. While they aren't pure electric race cars, they are an encroachment of electrification into what had been a purely internal combustion engine world. 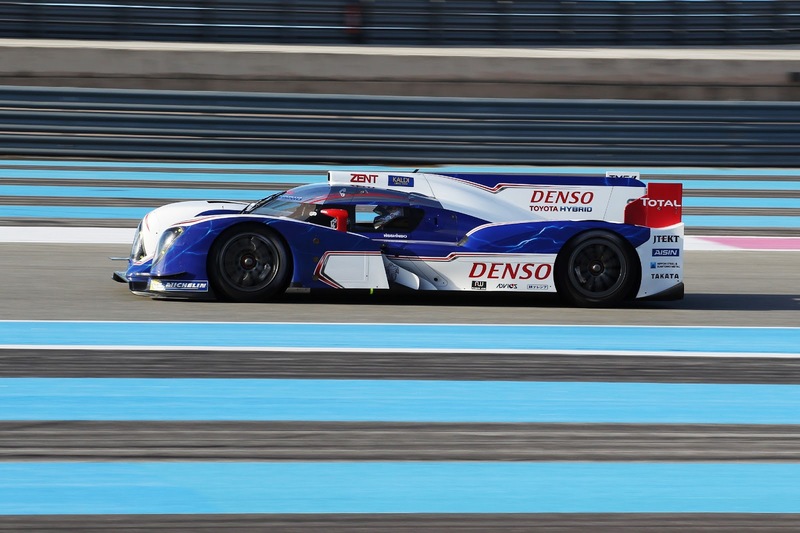 Toyota is planning to test the TS030 Hybrid race car at the Paul Ricard track in southern France on Wednesday 20 Feb 2013. 2012 was the debut season for Toyota's hybrid race car, and it was a powerful showing. The team raced only part of the season but had three wins in six races, and achieved podium finishes in most of the others. 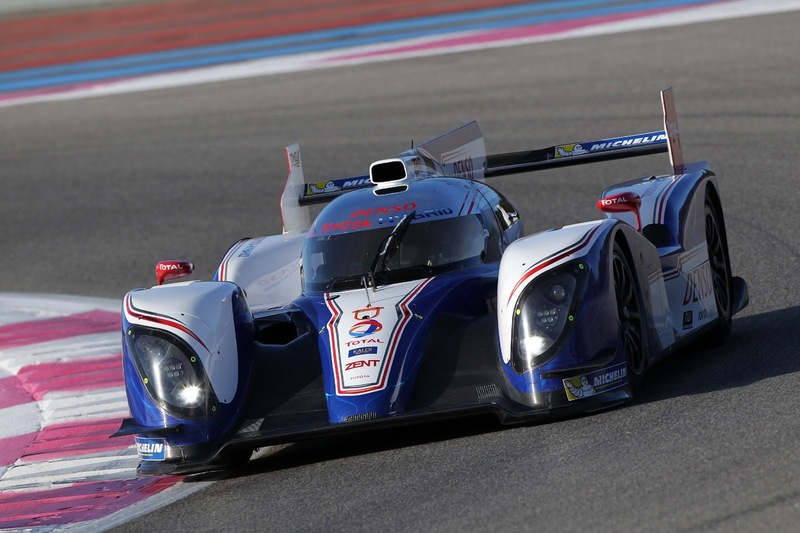 In the 2013 season the team roster is: Alex Wurz, Nicolas Lapierre and Kazuki Nakajima team up again in the #7 TS030 HYBRID. The #8 will compete outside of Le Mans for the first time, with Anthony Davidson, Stéphane Sarrazin, and Sébastien Buemi driving. The cars will again use the TOYOTA HYBRID System - Racing powertrain, developed exclusively for motorsport by TOYOTA's Motor Sport Division in Higashifuji. The super capacitor-based hybrid system delivers 300hp of boost automatically, on top of the 530hp generated by a 3.4litre, normally-aspirated V8 petrol engine. The chassis has also been modified for the upcoming season, with increased performance, reliability and serviceability the priorities. A revised aerodynamic package, including an updated monocoque, will deliver improved performance whilst minimising the impact of updated regulations in 2013 which increase the minimum weight for manufacturer LMP1 cars by 15kg. The following are statements from team members. At the bottom are specs published on their website. What are your feelings ahead of TOYOTA Racing's second season in WEC? I am very excited by the new season and I cannot wait for it to start. We achieved more than we expected in 2012 but this only motivates us to push harder and enjoy more success. I am eager to see how the updated TS030 HYBRID performs in race conditions and it's normal to also be a little tense before a season starts. We are competing against very tough opposition and we knew from the start of this project that we have to perform at our top level to achieve our goals. We believe we have made strong progress with the car but we will not know if it is enough until the chequered flag falls at Le Mans. My dream is to see a TS030 HYBRID crossing the line first. Is it realistic to think about the Le Mans and WEC titles? We took three out of six WEC races in 2012, and led Le Mans as well, so we showed not only potential, but solid results too. As a team we made big progress last year; we are still developing as a team but we can be proud of our hard work and fast learning. I believe it is realistic to target both titles but it will certainly not be easy; clearly we face an extremely strong competitor. It is a big challenge to become number one. We have huge respect for Audi's achievements and abilities, so we expect an exciting competition in WEC this year. Have you enjoyed your return to endurance racing? Personally I have many memories of endurance racing, particularly of being engine engineer on the TS010 in 1992 when we finished first at Monza and second at Le Mans. So it was good to be back in the world of endurance racing last year. We enjoyed the competition and the atmosphere in the paddock, plus some fantastic race weekends in front of great crowds. I'm looking forward to more of the same this year. How significant is the update to the TS030 HYBRID? There is a major regulation change in 2014 so this year's car has to be an evolution of our initial concept. The obvious target is to fix all the little issues we have found during the last season. The very first one is that the 2012 car, being a laboratory car, was able to accept front and rear hybrid systems, so we have redesigned the monocoque to optimize it without the front motor. Last year's performance was very satisfying and we felt we ticked most boxes so there has been no concept change, just refinement and optimization of the 2012 car. What was the reason to retain all six drivers? We thoroughly enjoyed working with Alex, Nicolas, Kazuki, Anthony, Stéphane and Sébastien in 2012 and their performances more than justified our choice. Retaining the same drivers was an easy choice. As well as showing impressive speed and great team spirit, they all contributed to developing the car and team during our first season. With a limited testing programme, their experience and dedication was a major factor in helping us win races in our first season of WEC. We cannot imagine a stronger driver line-up with which to approach next season. What was the most satisfying aspect of 2012 for you? The development of the team as a unit was impressive. When we started the project we brought together staff from TMG, Motor Sport Division and ORECA - people from different cultures and with different types of experience. Very quickly we saw the group come together as a team, working together to solve problems and increase our performance level. Thanks to the positive approach and dedication of all team members and partners, we have taken a big step towards maturity in endurance racing. We still have work to do and lessons to learn, but the last year has shown how quickly this team can progress. What are your ambitions for 2013? We are motivated by winning so our ambition is to win Le Mans for the first time and to win our first FIA World Championship title since the World Rally Championship in 1999. But away from our on-track ambitions, I also hope to see the WEC go from strength to strength. Last year was a very encouraging first season back for the WEC and in particular I was impressed with the large, enthusiastic crowds we saw at venues like Fuji Speedway and Interlagos. We are part of an ambitious championship which has the potential to grow significantly as fans become familiar with the great racing, friendly atmosphere and technical innovation which are the hallmarks of WEC. How do you evaluate the performance of the TOYOTA Hybrid System - Racing in 2012? It was a great experience for me simply to see this powertrain driving a TOYOTA LMP1 car for the first time and since that moment the story got better and better. Our system performed exceptionally well and clearly demonstrated the additional performance it is possible to generate via a hybrid system. I am very proud of the engineers, technicians and partners who developed and mastered this advanced technology; their hard work really paid off. Our reward was more than winning races; it was constantly motivating for us to hear the positive comments from the drivers about the extra 300hp hybrid boost and to watch them use this to their advantage on the track. 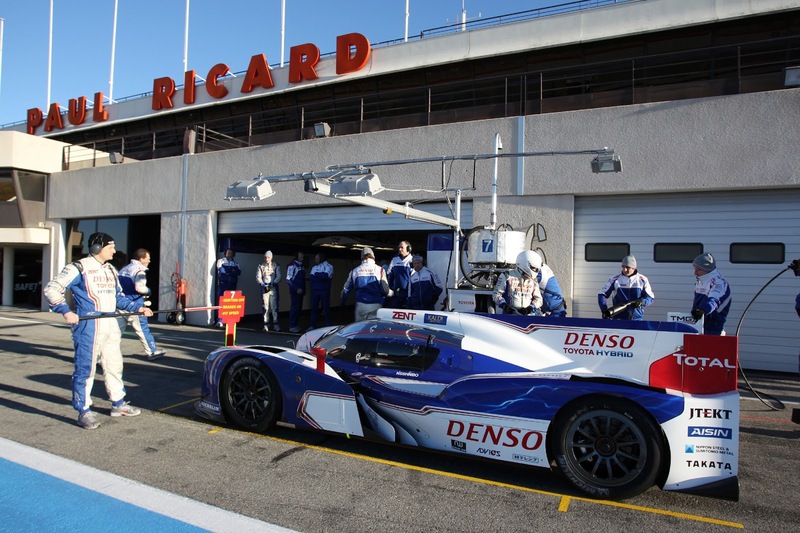 What has changed on the TOYOTA HYBRID System - Racing? The major milestones in development of our hybrid system are 2012, when it was integrated into the TS030 HYBRID for the first time, and 2014, when the technical regulations change significantly. For this year we have achieved some incremental improvements while including some pre-testing of 2014 technologies. We have polished up things like power and efficiency whilst also fine-tuning the powertrain to enhance reliability. Overall we are confident we again have a very competitive and reliable powertrain. 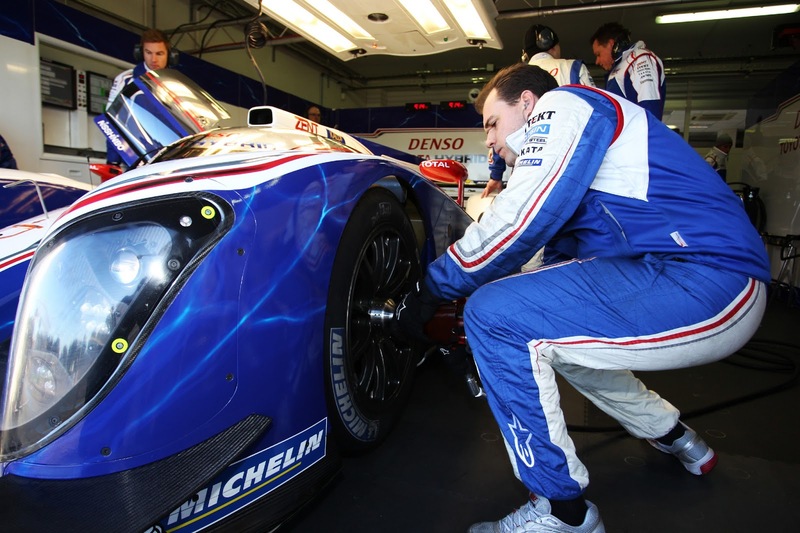 How do you evaluate the performance of the TS030 HYBRID in 2012? We were very pleased with how the car performed last year. When we started the design process we had three priorities: integrating the hybrid system, aerodynamic efficiency and tyre management. Over the course of the season our car showed itself to be very strong in all three areas so we hit our targets for our first season. Nevertheless, we found many small areas for improvement during the season. We have prioritised the most important areas and attempted to address these with the updated specification; there is always room for improvement. How many changes have been made for the 2013 TS030 HYBRID compared to last year's car? We took the chance to fine-tune various aspects of the car, making an evolution of the 2012 specification rather than a new concept. We have removed the front hybrid capability, resulting in more efficient packaging and aerodynamics. This helps us to manage the 15kg minimum weight increase without compromising performance too much. Our simulations show we have made good progress in performance, and our hands-on experience suggests we have eliminated some of the serviceability issues which occasionally cost time in 2012. 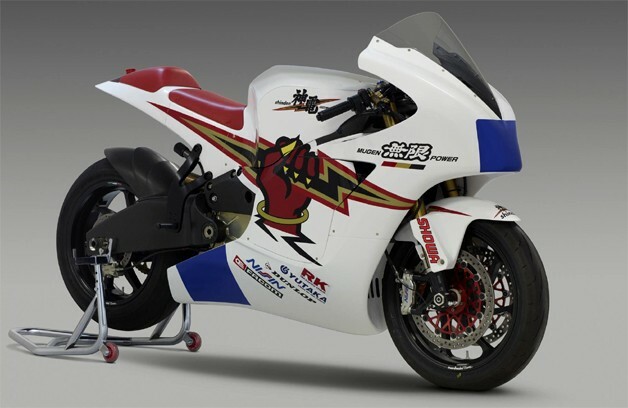 As expected, Team Mugen Shinden is returning to the Isle of Man TT ZERO for 2013. The announcement is scant on details, but promises a significant performance increase over the 2012 bike. Considering that for their initial outing the team took second place to MotoCzysz, I'd say it's clear that MotoCzysz has some real competition to worry about. Mugen Shinden is seen as being closely allied with Honda, and essentially is a factory team for Honda. However this theory was denied by Mugen Europe's Colin Whittamore at the 2012 TT ZERO. The announcement of their 2013 TT ZERO participation says something a little different. M-TEC developed the original EV bike, " (SHINDEN)" in order to showcase the company´s advanced clean emission technology and their creativity to the world, while at the same time gaining valuable experience and education for the engineers of the next generation for the future of the company. Whoever it is that's behind Mugen's TTZERO team, they achieved a 2nd place finish and broke the 100 miles/hr lap speed barrier. The 2013 bike was developed based on data captured from the 2012 bike. They reduced the weight of the motorcycle body and EV system. They worked on aerodynamics. They are promising a significant performance boost. John McGuinness is returning as their rider, he has won 19 times in IOM TT races. Nissan has unveiled a new version of the souped up Leaf, the Nissan LEAF NISMO RC (Racing Competition). 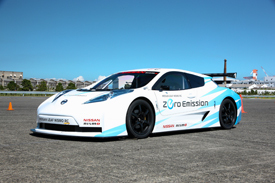 The NISMO RC Leaf was first unveiled in 2011, appeared in some exhibition events, and then had a racing debut last September at a Japan Electric Vehicle Racing Association (JEVRA) event. That version of the NISMO RC Leaf came in second place to a Tesla Roadster. A press release put out by Nissan today describes the NISMO RC Leaf, but doesn't make it clear whether there is an updated version of the car or not. It was described as a "rolling laboratory" by Darren Cox, Nissan's Director, Global Motorsports, who said said: "Combining the talents of NISMO, Nissan's world renowned motorsports group, and engineers behind some of the company's Super GT and FIA GT1 race teams, the Nissan LEAF NISMO RC serves as a rolling laboratory for the accelerated development of EV and aerodynamic systems, as well as a platform for the development of new green motorsports series." All the drive train components are direct from the Nissan Leaf. That includes a lithium-ion battery composed of 48 compact modules and a high-response 80kW AC synchronous motor that generates 107 horsepower and 207 lb-ft of torque. It even has a CHAdeMO charging port for fast recharging. The fast recharge is gonna be important at the track so that drivers get in as much track time as possible per day. The LEAF electrical system is, however, housed in a rather different car. The car body is a carbon fiber monocoque, designed in three sections. The front and rear sections are removable, the windows are fixed, LED headlights and taillights and adjustable rear wing. The NISMO RC Leaf has a wheelbase 3.9 inches shorter, and 6.7 inches wider. The car sits almost a foot lower, obviously for aerodynamics. The weight, at 2,068 pounds, is about 40 percent less than the production Nissan LEAF. The NISMO RC LEAF also utilizes a double-wishbone suspension design front and rear and driver-adjustable brake balance. It rides on 18-inch 6-spoke wheels and 225/40R18 Bridgestone racing tires. The speed isn't exactly blistering, but then they are using the LEAF drive train. While it's a respectably fast car, the regular LEAF was meant as a family car, not a speed demon. The NISMO RC LEAF has a 0-60 time of 6.85 seconds and a top speed of 93 miles per hour. At racing speeds it lasts for 20 minutes of track time. That should be good for maybe 10 laps on most tracks. We appreciate that they're trying out something different with the LEAF. The production LEAF has an image among car buyers of being pokey, when in truth it has decent acceleration and top speed. At the 2012 REFUEL electric car race a Nissan Leaf even beat a couple Tesla Roadsters. That LEAF had had a few suspension and aerodynamics tweaks done to it. Two weeks ago word came from Japan that Nissan NISMO had agreed to produce a NISMO LEAF for production and sale to the public. In this case while carrying the NISMO name, it is not the NISMO LEAF RC which will be put into production, but a tweaked-up-by-NISMO production LEAF which will see a small production run. That car will be sold only in Japan, for now, to gauge market reaction before trying to sell it internationally. "There's a perception among some people that electric vehicles fall on the dull side of the automotive enthusiasm scale – which is certainly not the case with either the production Nissan LEAF or this electrifying Nissan LEAF NISMO RC," added Cox. "Nissan LEAF owners are fully embracing this new world of zero emission technology. We believe the same potential exists in the motorsports world as well, with Nissan proud to be first on the starting grid."